The Hudson Valley Seed Library is expanding their offering of Art Packs in time for the holiday season. This year the seed sellers will offer sixteen new designs. 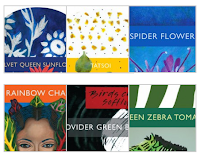 A peek at the top flaps of the new 16 seed packs is available on their blog. The new packs will be available starting in November 2010. Also, in November there will be a gallery show of the original artwork used to create the packs at the Kingston Museum of Contemporary Art in NYC. On October 6, 2010 The New York Times published this great article on the Hudson Valley Seed Library.